Hi there! Today I’m sharing a review for a newly-released YA romance from Kate Watson. 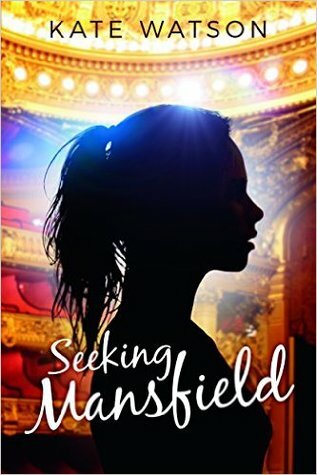 SEEKING MANSFIELD is a contemporary re-telling of MANSFIELD PARK, an Austen novel I haven’t read. 4.5 Stars for this contemporary retelling of Jane Austen’s MANSFIELD PARK. Finley Price is sixteen and living with her godparents, the Bertram’s, now that her famous actor father has died and her abusive alcoholic mother is in jail. The Bertram’s have three kids, Tate, Juliette and Oliver—who is Finley’s best friend—even though he has a giant crush on Finley. Juliette is mean and petty, and their aunt is spiteful and awful, pretty much telling Finley she ought to behave like a servant in the Bertram household. Finley is a theater aficionado, and been working stage crews for years. Her deepest desire is to be a part of the Mansfield Theater Program, but she lacks the confidence to apply—and to ask for help. Oliver wants to send the application in for Finley, but listens to his father’s advice on the subject. Oliver just wants what’s best for Finley—and for her to seek it for herself. New neighbors, Emma and Harlan Crawford arrive, and their status as teen movie stars is exciting to everyone but Finley. She’s used to blending into the background, and is afraid Harlan will make things difficult. He once starred in a movie with her father. New friendships and relationships develop, with power-brokering happening too. Emma is sweet on Oliver, but she recognizes that Finley needs to be a priority in his life. For me, it seems manipulative, and the blurb gets it right that Harlan pursues Finley mostly out of boredom and the desire for a challenge. That said, Finley isn’t easily won over, and there are lots of peaks and valleys in the myriad love stories that are taking place. It’s kind of a love-square (as opposed to a triangle) situation and I know that’s not cool for all readers. For me, the love angles can be summed up thusly: if you can’t be with the one you love…(honey)…love the one you’re with. I really liked Finley, and those who’ve read Mansfield Park all agree that she’s a far more interesting and strong heroine than her model (Fanny Price). Finley’s survived a lot of challenges, and she faces new ones with compassion and strength. For all the love stories in the book, this is a clean read with just kissing on the page. That said, there are allusions to off page sexcapades, which form the base of the final conflict. As a YA book, it felt accessible and interesting. I think teens will be interested in the theater aspects and celebrity issues, which update the plot for modern readers. The HEA comes on the closing pages, and it seems like there could be more of this story to tell. Interested? You can find SEEKING MANSFIELD on Goodreads, Amazon, Barnes & Noble and iTunes. I received a review copy via NetGalley. Find Kate on her website, Facebook and twitter.